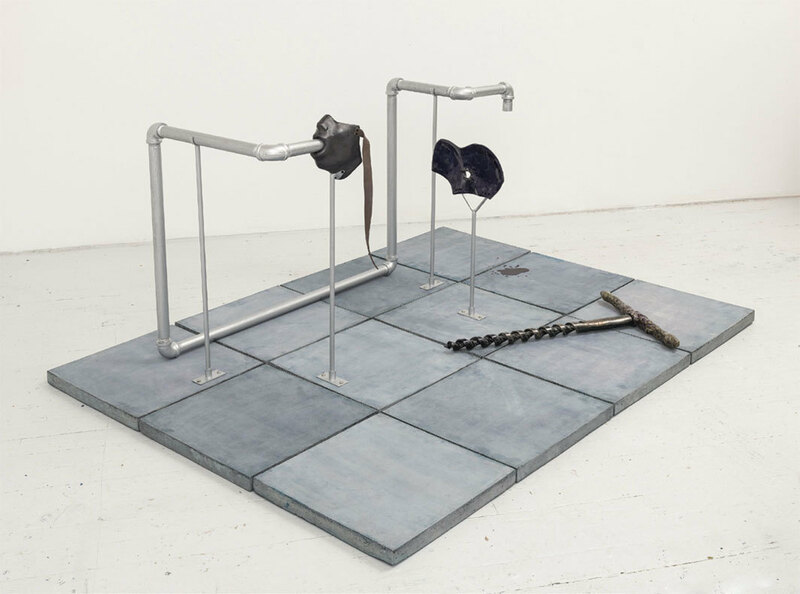 Julia Philips, Extruder (#1), 2017, partially glazed ceramics, nylon screws, metal struts, metal pipes, concrete tiles, lacquer, 33 7⁄8 × 51 1⁄4 × 68 1⁄8". Blinder, Intruder, Distancer, Muter, Aborter: Julia Phillips titles each of her sculptures after its purpose. Who carries out these functions? Ambiguity menaces the German-born, New York-based artist’s work, in which intimacy, race, and power are interrogated—to use one of art criticism’s most trite verbs, but one that aptly captures the spirit of Phillips’s first museum solo exhibition, “Failure Detection,” whose austere rooms conjure both torture chambers and medical facilities.